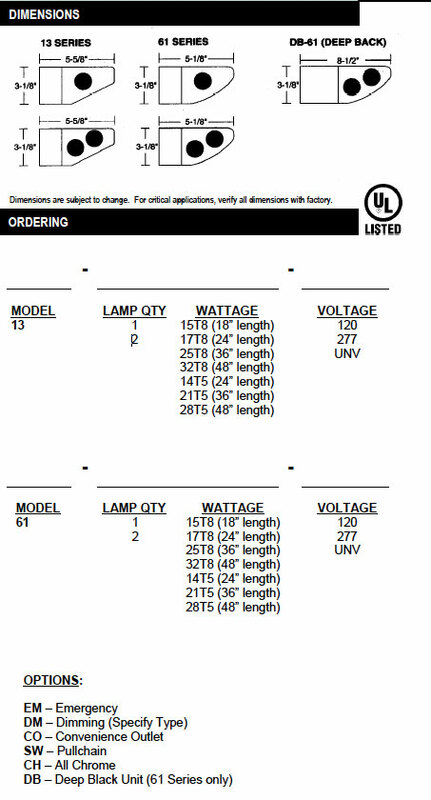 These Wall Bracket Luminaires are available in 18”, 2’, 3’, and 4’ lengths in 1 and 2 lamp configurations, T5 and T8. These units feature the smooth, sleek style of the 13 Series, and the rounded, rib style of the 61 Series, to create an attractive appearance that compliments any wall surface. The perfect choice for illuminating mirrors, vanities, bathrooms, and any utility area. For horizontal mounting. Optional convenience outlet and switch to accommodate any requirements. 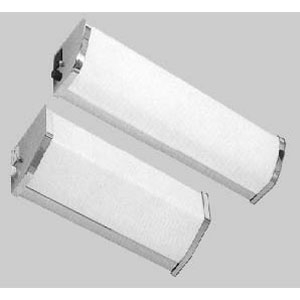 Optional deep-back housing for mounting over surface medicine cabinets (18″ and 24″ for 61 Series only). Standard, white opal acrylic diffuser for the 13 Series. Ribbed white opal acrylic extruded lens for the 61 Series is standard. Housing and interior reflecting surfaces, finished with premium grade, baked white enamel with a minimum 89% reflectance, applied over iron phosphate pretreatment, for maximum adhesion and rust resistance. End caps triple processed electrostatic chrome plating for durable finish. All white (housing and ends) is standard, all chrome is optional.